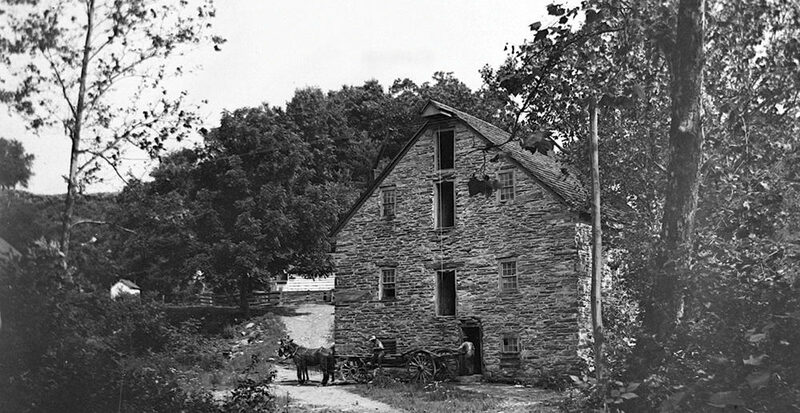 Cook’s Mill, shown here around 1890, is one of the several 19th-century stone grist mills surviving in Adams County. This one, located a mile north of Bendersville in Menallen Township along Possum Creek near the intersection of Bendersville-Wenksville and Pinegrove Furnace Roads, was owned by Jesse Cook from 1838 to 1863. The mill and other structures on the property served as refuge for escaping slaves using the creek as an avenue for freedom. A favorite memory of Cook’s daughter, Sarah, was the day she witnessed President Lincoln giving the Gettysburg Address in November 1863. She was still vividly recalling the details in a 1933 interview when she was 90.